There comes a time in the development life cycle of electronic equipment where things get a bit, well, Terminator. Your electronics get ideas of their own and start ordering you about. For instance, Yamaha's RX -V2065 receiver suggested, in no uncertain terms, that I leave the room while it sets itself up. Yikes. Of course, this request is to protect one's sensitive ears from loud noises during set up – which is quite ironic as less than two minutes out of the box this Yamaha could be turning your liver inside out with its bass power and punch. 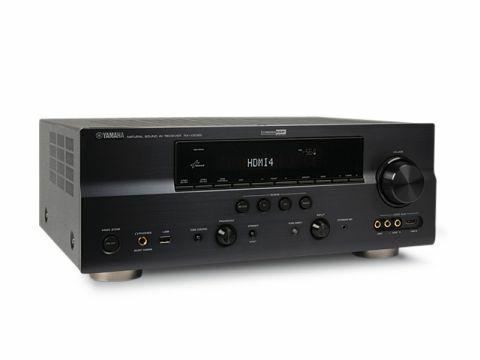 In fact, the interface and personal requests are all part of Yamaha's brand-new GUI, which has been designed to make setting up a complex beast like this near £1,000 receiver simpler than ever. Maybe it is a lack of familiarity, but right now I don't get it. For starters, access to the set-up functions are buried at the bottom of three or four pages of source selection icons. The only feature you would not go into the menus for is source selection (you can do it via direct keys on the remote and the fascia) so why have pages of icons heading up the menu? When you are into the features and functions area, it is laid out in a disjointed format with lots of unlinked individual pages rather than traditional left to right flowing menus. I had to refer to the manual on several occasions just to find various functions. I'm not getting the new cosmetics either. It looks cheaper and feels less solid that Yamaha's previous AVRs at this price, although the brand says build quality is improved over last year's RX -V1900. It offers some very slick features, though. The 5-in, 2-out HDMI functionality is brilliant, particularly as one input is front-mounted, and the claimed power figures are mighty impressive. Moreover, the RX -V2605 is very much geared up to be a network receiver with both Ethernet and USB inputs; a port for Yamaha's optional Bluetooth receiver or iPod dock; and plenty of dedicated network audio features. There is very simple connection to a PC-based home network, a compressed music enhancer, and tricks like pulling photos from your PC to display onto your TV. And despite what I said about the GUI, the network side of the RX-V2065's is pretty damn straightforward to get going. Needless to say, it ticks all the boxes in terms of 1080p video upscaling and HD audio decoding although, unlike its direct Onkyo TX-NR807 competitor, it is bereft of Dolby Pro-Logic IIz. Yamaha instead uses its Presence (height) channels at the front with bespoke processing. Equally, like the Onkyo, you will lose rear-back channel amplification to drive the fronts. running the auto-set-up, the result is a monster of sound with bass coming in hotter than Angelina Jolie on a skateboard. The sub was set two or three DB strong and the balance with the YPAO room EQ set to 'standard' (and that's it for options other than 'off' and 'manual') was fruity and fulsome. Trim back the bass, switch off the YPAO EQ and there is an amplifier with a heart of gold. It's smooth yet detailed, fast yet subtle, and never once gets you wincing at an over acerbic high frequency effect or belly laughing at a bulbous bass note. It feels mature, grown up and sophisticated with a fabulous balance between spacious soundstage and accurate positioning of individual sounds. And this natural balance makes it quite an all-rounder, as happy with all-action block busters as it is with a chick flick or a Pixar masterpiece. It feels seamlessly solid and has one of those sounds that lets all the speakers, the amplifier and the mechanics of home cinema simply slip into obscurity, leaving you to enjoy the movie. Okay, it's never going to have your knuckles whitening on the arm of the sofa, and the over-complex GUI is a bit of a letdown. But taken as a whole, Yamaha has developed the RX-V2065 as a 'fire up and forget' receiver for those who just want to enjoy a broad range of movies without too much faffing about. And on that level, it's a rampant success.